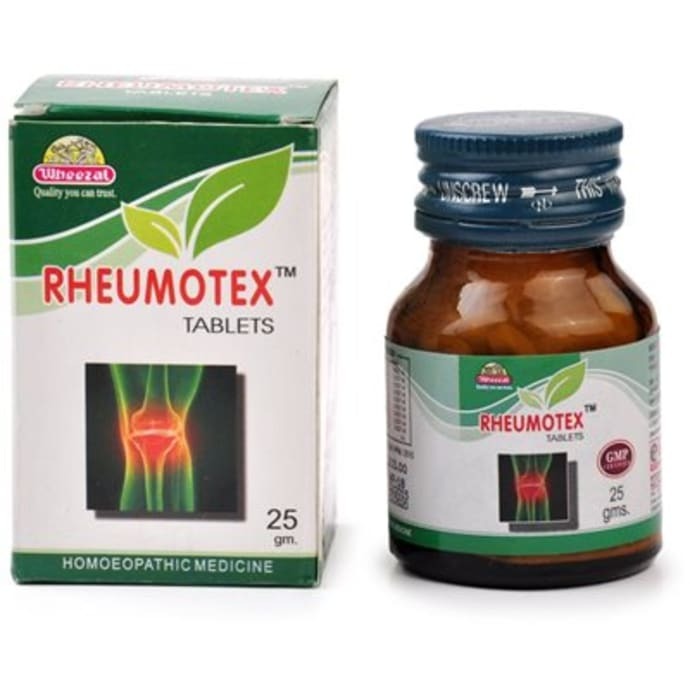 RHEUMOTEX TABLETS RANGE OF ACTION: Chronic Gout, Sciatica, Lumbago. Neuralgia, Rheumatic Myalgia and Arthritic Diathesis. COMPOSITION: Chamomilla Q, Arnica Q, Rhus Tox Q, Dulcamara Q, Ruta Q, Bryonia alba Q, Rhododendron Q, Acid Benz. Q, Kali Iodide Q Dosage: 4 tablets four hourly or as prescribed by the physician. A licensed pharmacy from your nearest location will deliver Wheezal Rheumotex Tablet. Once the pharmacy accepts your order, the details of the pharmacy will be shared with you. Acceptance of your order is based on the validity of your prescription and the availability of this medicine.